Summer has officially ended and many Aussies are really, really glad that it has. Various groups have presented comment or analysis on it and I have collected some of the best information and graphics here. In terms of both maximum and mean temperatures, summer 2012–13 was the warmest on record for Australia. Minimum temperatures were also significantly above average for the season, placing as the sixth warmest in 103 years of record. All mainland States and Territories recorded maxima in the top 10 records for summer; only a strip of the east coast and part of Western Australia recorded near-average maxima, associated with above-average rainfall. Minima were also generally above to very much above average, with scattered areas across the tropics and part of South Australia recording near-average minima. Summer rainfall was below average for most of Australia, except for most of Western Australia and a strip extending along the east coast and adjacent hinterland from Mackay to southern New South Wales. Across this part of eastern Australia rainfall was above average, and generally in the highest decile closer to the coast. Rainfall was also above average in western and northern Western Australia, excluding the far north. The remainder of Western Australia and the central Northern Territory recorded near-average summer rainfall. Clicking on the above will, as usual, get you a bigger image but there is also a poster-size version (3 MB) here in case you want to print it. In response to the disasters, various people went online. Townsville Storms is a Facebook page set up for “Weather & Community Info, Photos & Social Page for Gladstone to Cooktown, west to Mt Isa” by “Shane, Narelle, Trish, Allan and Shaun.” NQ Flood Update is similar but covers Sarina to Cape York and was an offshoot of a “CQ Flood Update” page. It’s great to see people getting out there and sharing information! The official counterpart of those two is the Queensland Weather Fire Road & Police Warnings FB page. 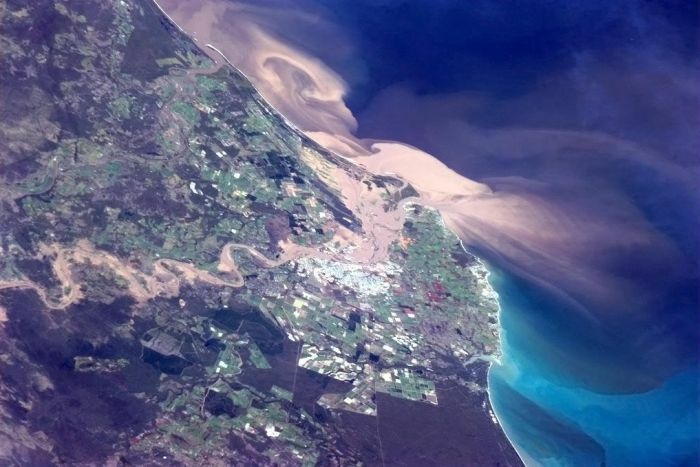 At the height of the Queensland floods, a Canadian astronaut captured images of the Queensland floods from a unique angle: Commander Chris Hadfield took photos while passing over central Queensland in the International Space Station on Tuesday 29 January, sharing them with the world via Twitter. The Angry Summer is a report by Professor Will Steffen of the Climate Commission. 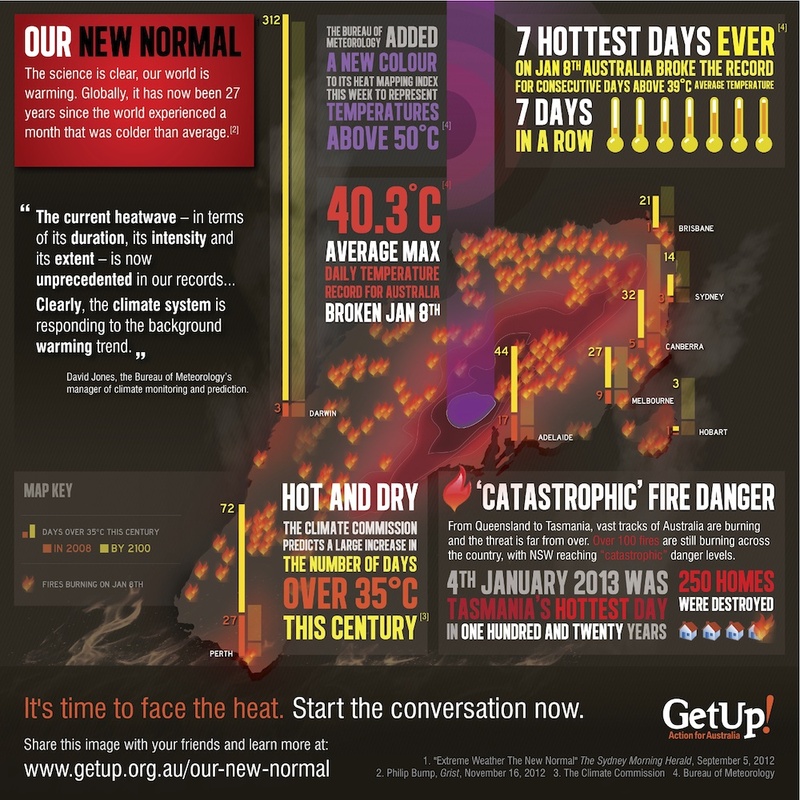 Its “key facts” begin with, “Extreme weather events dominated the 2012/2013 Australian summer, including record-breaking heat, severe bushfires, extreme rainfall and damaging flooding. Extreme heatwaves and catastrophic bushfire conditions during the Angry Summer were made worse by climate change,” and a dozen pages detail the events and sketch the science which links them firmly to our changing climate. Again, there are some great graphics – print them out and post them on a notice board!